The management of IWN Media, publisher of iWitness NG – www.iwitness.com.ng – has concluded plans to launch its free e-newspaper edition. The company said this in a statement by its acting head of operations on Saturday. According to the statement, making the e-newspaper free is to enable the company to achieve its objectives within the shortest possible time. The statement added that the e-newspaper would be available for download on its website and other social media platform. The statement read in part: “We are focused at ensuring that Muslims are not denied information about Islam and Muslims in Nigeria. Over the years, we have been able to create contents that unite and celebrate Muslims. In a bid to deepen our focus and make our goals more realisable, articles and news items on our website will be compiled into an e-newspaper which will be made avaible for free to our subsribers and readers. 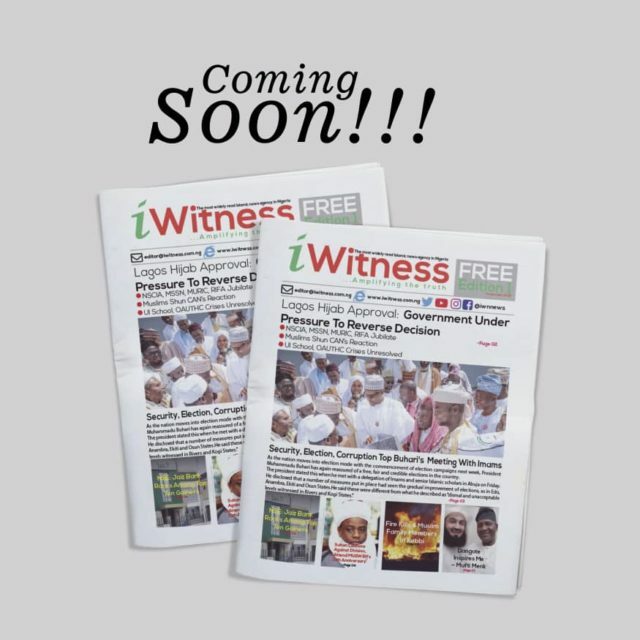 “This will be the first Islamic free e-newspaper in Nigeria. “Coming November ending, the colourful, readers-friendly and well-enriched e-newspaper, which will commence with eight pages, will be made available every Sunday, In Sha Allah, for our readers. The e-newspaper is designed to consume minimal data and space on mobile devices and desktops. Readers will also have options to either just read or download and read. We assure our readers of our commitment to get the news down to their doorsteps without stress and at little or no cost. “The e-newspaper will replicate all existing pages on our website and will maintain our core values, ISLAM – Integrity, Sincerity, Loyalty, Accuracy and Modesty. It will ensure the amplification of truth. It will explore contents from our correspondents across all the geographical regions in Nigeria. The company also commended its readers for their loyalty, adding that the website has grown to be one of the most relevant among Muslims in Nigeria and beyond.